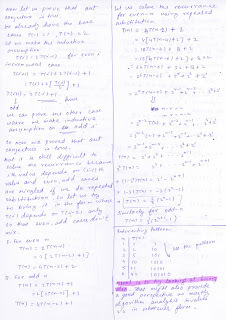 These are my notes from 7th lecture of discrete mathematics course taught at Arsdigita university by Shai Simonson. Other posts relating to this are here. Model the problem in mathematical terms. Then we reduce the original complex recurrence relation into a very simple recurrence relation that is solvable easily with repeated substitution techniue. 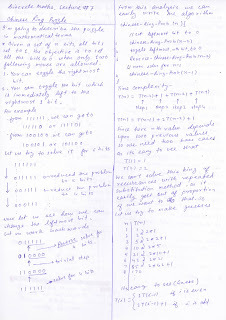 We make other important observations like the pattern in the binary representation of T(1), T(2)... that immediately fits a pattern in the first look, so the moral is that one can try looking at alternate representations of the same thing to get different interesting perpectives... explore! Then we make a note that the sequence generated by chinese ring configurations is also a gray code sequence that is the next configuration in the sequence differs from previous only by one bit.